Lyon became the first finger spinner to bag Australia’s men’s Test player of the year. The Australia Cricket Awards took place today and it saw the deserving players, both from the male and female team, being crowned with various awards. Australian women’s cricketer Alyssa Healy, also the wife of the men’s team’s fast bowler Mitchell Starc, won as many as three awards- Female ODI player of the year, Female T20I player of the year and the Belinda Clark Award. The award function didn’t have the likes of Steve Smith and David Warner, both of whom weren’t invited due to them being in the one-year suspension period. 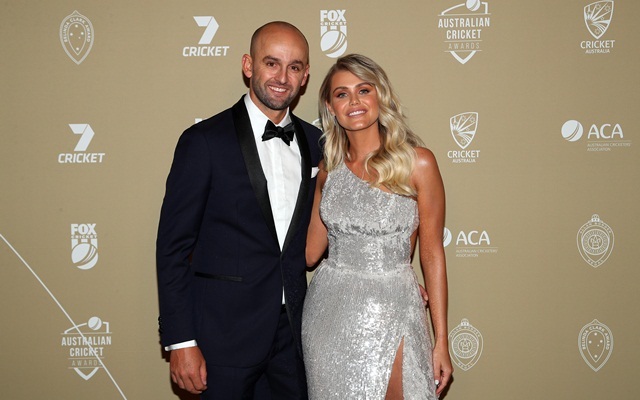 The event was also a one memorable for Nathan Lyon as he became the first finger spinner to bag Australia’s men’s Test player of the year. He garnered 25 votes from his teammates and umpire/media representatives. The New South Wales-born attended the show with girlfriend Emma McCarthy. Lyon and McCarthy posed for the photographs, walking the black carpet, before entering the Palladium on Monday as per reports in www.dailymail.co.uk. The tweaker sported a navy suit over a white shirt with black lining and a matching bow tie. McCarthy wore a sparkling silver dress with a thigh-high split. Three years ago, Lyon came to the show with pregnant ex-wife Mel Waring. Even then Lyon clicked a few adorable pictures. Lyon split with Waring back in 2017 and got into a relationship with McCarthy. From the cricketing perspective, the 31-year-old had a stupendous year in 2018 as he finished with 49 wickets from 10 matches with a couple of five-wicket hauls. The spinner also turned out to be the joint-highest wicket-taker with Jasprit Bumrah, the Indian fast bowler, in the recently concluded Test series against India. Having played a few ODIs against the Men in Blue, the experienced Lyon is also in contention for a berth in the World Cup squad.